George Roy Hill’s Western Butch Cassidy and the Sundance Kid was the first of two movies featuring acting legends Paul Newman and Robert Redford. 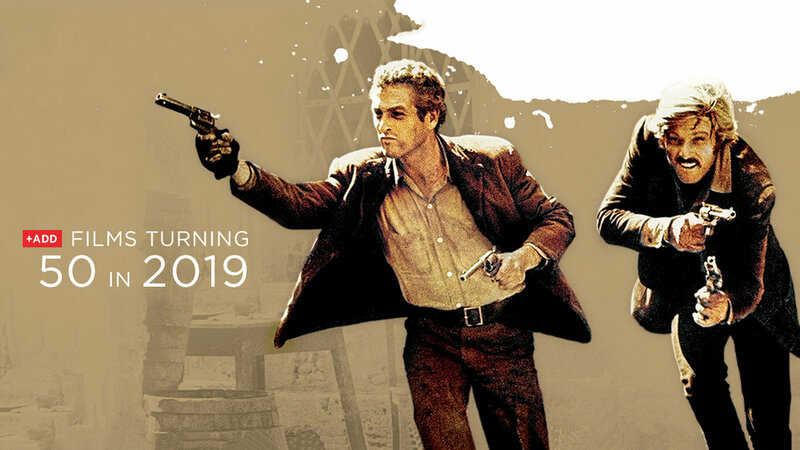 Based on the story of the real duo of Wild West outlaws who traveled down to Bolivia to continue their railroad and bank robbing spree, the movie was the #1 box office hit of 1969. It is provocative, action-packed and full of thrilling and humorous moments. Newman had recently scored a hit with Cool Hand Luke and Katharine Ross, who plays love interest and co-conspirator Etta, was recently in The Graduate. For Redford, the role of Sundance the Kid was his breakthrough performance. For fans who have seen the recent film The Old Man & the Gun where Redford plays a seasoned bank robber, Butch Cassidy and the Sundance Kid is essential viewing. The Sundance Film Festival, held every year in January, was started by Robert Redford’s company Wildwood and the Utah Film Commission and got its name from Redford’s character in the film. This one is for all the misfits out there! If you’ve ever felt like you were misunderstood and didn’t belong then Easy Rider is the film for you. I was skeptical about this film at first. I thought it would be a boring film about a drug fueled road trip but instead I found a story and characters that really resonated with me. Not only did Easy Rider capture the zeitgeist of the era it still speaks to future generations of lone wolves who don’t feel like they fit in with mainstream culture. The film stars Peter Fonda as Captain America and Dennis Hopper (who also directed the film) as Billy, two misfits traveling across state lines on their motorcycles. On their journey they meet fellow outsider George Hanson (Jack Nicholson). Their appearance and attitude attracts negative attention along the way and this culminates in one of the most powerful cinematic endings. The story works on so many levels and its cultural impact is undeniable. Easy Rider was the 3rd highest grossing film of the year and still endures as a classic. Much like Easy Rider, Midnight Cowboy spoke to the counterculture movement of the late 1960s and featured two outcasts who form an unlikely friendship. Directed by John Schlesinger, Midnight Cowboy stars Jon Voight as Joe Buck, a cowboy who leaves Texas for New York City and becomes a gigolo. He meets con artist Ratso Rizzo (Dustin Hoffman), who at first steals his money, but then becomes his pimp. The premise sounds like a bleak urban drama, but these two character develop a supportive relationship that is heartwarming. We get to know these two characters and care for them. Ratso helps the naive Joe adjust to his new life in the city and Joe helps the Ratso as his health begins to fail. Midnight Cowboy received an X-rating for its sexual content and was the first film with that rating to win an Academy Award for Best Picture. It also won for Best Director and Best Adapted Screenplay and its two stars were nominated for Best Actor. It was the second highest grossing film of the year. The final scene of the film with Joe and Ratso traveling on a bus to Florida, gets me every time. On Her Majesty’s Secret Service is the sixth film in the James Bond franchise and the only one featuring George Lazenby in the title role. Lazenby had the looks and attitude for the part and producers Albert Broccoli and Harry Saltzman and director Peter Hunt took a chance on this unknown after Sean Connery retired from the role. Based on Ian Fleming’s novel, the story takes place in the Swiss Alps where Bond is on the hunt for SPECTRE’s secret headquarters. He falls in love with Tracy (Diana Rigg), the daughter of crime boss Draco (Gabriele Ferzetti). Telly Savalas plays the villain Ernst Stavro Blofeld, a character that went on to inspire Dr. Evil in the Austin Powers franchise. The film features a thrilling ski slope chase sequence worth the price of admission alone. It was the tenth highest grossing release of the year and while it wasn’t fully appreciated during its time, it’s grown in popularity with Bond fans over the years. It’s true that Westerns were waning in popularity by the end of the 1960s but that didn’t stop filmmakers from producing some of the best of the genre during this time period. In addition to films like Butch Cassidy and the Sundance Kid and True Grit, there was The Wild Bunch, director Sam Peckinpah’s gruesome period drama. The film stars William Holden as Pike Bishop, the leader of his “wild bunch” which includes fellow outlaws Warren Oates, Jaime Sanchez, Ben Johnson, Edmond O’Brien and Ernest Borgnine. This mismatched band of criminals are out for one last big heist but little do they know that Deke Thornton (Robert Ryan) and his bounty hunters are laying a trap for them. The Wild Bunch is full of heists, guns, violence, women and booze. The film was praised for its filmmaking techniques but criticized for its graphic violence. It’s not for the faint of heart. Browse the list of our top rented 1969 films and add some to your queue! Curious how they rank in terms of rentals? Here they are (and it surprises no one that Butch Cassidy comes in at #1). Raquel Stecher has been writing about classic films for the past decade on her blog Out of the Past. She attends the TCM Classic Film Festival as well as other events where old movie fanatics get together to geek out. Raquel has been a devoted DVD Netflix member since 2002! Follow her on her blog Out of the Past, or find her on Twitter @RaquelStecher and @ClassicFilmRead, Facebook, and Instagram.